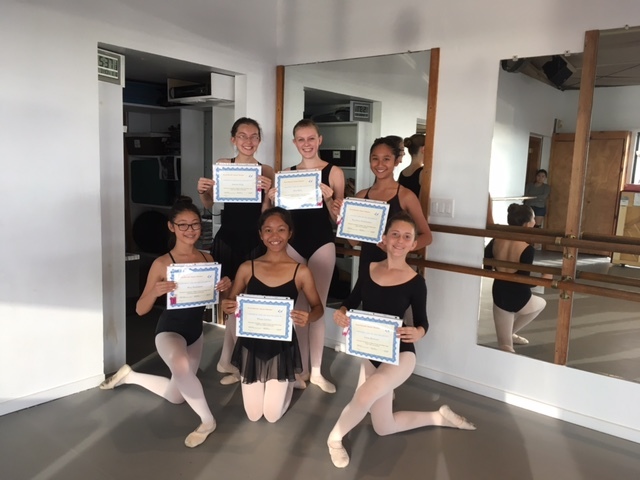 West Hawaii Dance Theatre & Academy is pleased to announce six students have successfully completed both the physical and written Examination for Classical Ballet Level II, and are now eligible to begin their Pointe work studies. Serious ballet students who wish to dance on pointe are required to have taken at least 3 years of Classical Ballet Technique, attending a minimum of 3 classes per week. Pointe work is demanding. Pointe shoe candidates must be at least 11 years old, have good alignment and posture, physically be able to execute certain technical classical ballet elements, and must pass a 100-question written exam of ballet terms. West Hawaii Dance Theatre is a 501 (c) 3 Non-profit educational organization and is sponsored in part by the Hawaii State Foundation on Culture and the Arts, Atherton Family Foundation, Hawaii Community Foundation, Hawaii Tug & Barge, Vance Wall Foundation and our local businesses and families.